Our seafood appetizer trio includes Jumbo Shrimp Cocktails, delicious Crab Cakes, and Legal's rich New England Clam Chowder. This is one delicious gift combination, worthy of the top spot on anyone's list. 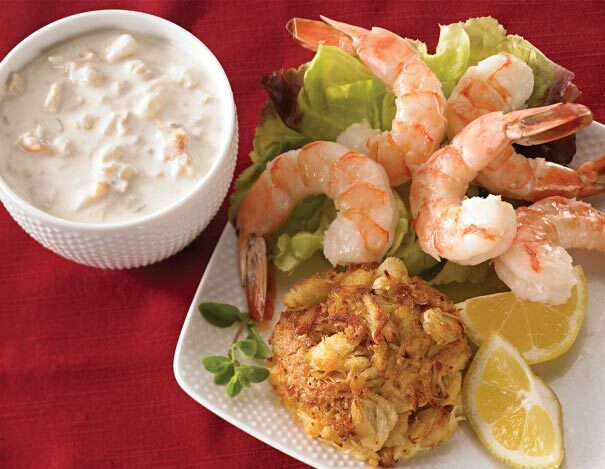 Our Shrimp Cocktail and Crab Cakes are shipped frozen and can be kept refrigerated for 3 days or frozen for 30 days. Contains: Shellfish, Fish, Milk, Wheat Oyster Crackers: Unbleached Wheat Flour, Water, Canola Oil, All Natural Evaporated Cane Juice, Salt, Yeast, Baking Soda. I am a long time Legal customer. Restaurant meals are great. I have ordered gifts for family and myself. The food was fresh and delicious. This time Legal choose a delivery service I have no experience with...very disappointed. The company is Dicom and I will not use them again. The order was NOT delivered on time and Dicom made no effort to contact when they did not deliver. I had to chase the order over the phone and finally it was delivered the next day. Legal Seafood was very proactive and refunded my delivery fee.